As we pass the finish line for February, let's re-cap the month. 1.) This pic is the only pic of me taken by the "pro" at last week's Ugly Mudder. Since I'm walking across the line in this pic, I won't be buying it. 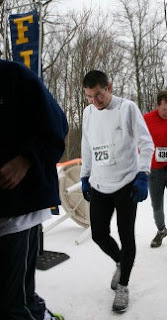 Still, I am pleased with the results of the run, coming in 55th out of 132 in my age group. Purty cool. 2.) I ran 69 miles for the month, my 3rd best month ever. 3.) I biked 144 miles for the month, though - my best month to date for biking. 4.) All total, I worked out thirty minutes longer than January, which had been my previous best. Keep in mind, I did this in three fewer days. 5.) Throwing out the Ugly Mudder Trail run, my runs averaged eight seconds per mile faster than January. 1.) Continued pace improvement in running. 2.) 72 miles, minimum, for running. 3.) 12 biking workouts, at a minimum of 60 minutes per. This would be a 25% improvement over this month. So yesterday was the 2007 Ugly Mudder. Seven and ¼-ish miles over the steepest, ugliest trails in Reading. That’s how the race always comes. This year, three inches of ice were added to it for good measure. In my head, I always picture these races to be smaller than they are. This time around, I figured a lot of people wouldn’t come because of the impending snow. I think I was wrong, though final figures aren’t in yet….there was a crazy mob of people there. They call this one of the largest trail runs east of the Mississippi and it probably had 700 or so, total. Literally, the entire course was on either hard crusty snow, except the parts that were on hard crusty rocks and a few very short parts over roads. Mud would’ve been welcome, actually. 48 hours from a muddy hell or a slippery heaven - what we see is always dependent on where we stand. Yesterday, I planned on a nice and easy lunchtime 10k, figuring that Sunday will be the day this week that I pound it. Problem was, it was pouring rain and - moreover - my legs felt good. I didn't really feel like taking my time in that crap. And the more I thought about it, the more I realized that because Sunday is a trail run, and a brutal one at that, my time's going to be lousy, no matter what. Heck, the course record is over seven minutes per mile, so why bother saving my legs? So, instead of a leisurely 8:40 per mile like I planned, I did the course in a soaking wet 7:58 per mile. Good news is, I don't feel totally trashed and after an easy bike ride tonight and a rest day tomorrow, I think I should be ok in the mud. I haven't blogged much about Floyd Landis, lately. Floyd and I share the same hometown and I was one of the people who went nuts after Floyd's amazing ride last year, and was totally bummed days later when Tour officials said he failed a drug test. Not bummed because I thought for a minute Floyd was guilty - a. he's not the type and b. if he were, that drug wouldn't have helped him and c. if he were the type to take a drug that wouldn't have helped him it wouldn't have been in his system just that one day - but bummed because, given his age and the political climate, he'll probably never get back what he deserves: the glory, respect and riches that a Tour winner deserves. Dead Legs or Butterflies in the Belly? After a decent seven mile run at eight minute pace Sunday, I took off yesterday and just came back from a lunch-time 10k at 8:30 pace. To sum, I'm way tireder than I should be. Whether that's because it's been too long between races that my motivation needs a little boost or Sunday's run was a bit brisker than it should've been or I'm just getting cagey about next Sunday is hard to say, but I'm eager to get some fire back in my belly. Good news is, I know it's coming. Sunday's race will leave me feeling good, as will the one after that and the one after that. My fitness level isn't anywhere near top-of-my age-group yet, but there's something about the race experience that serves to fire me up, and it's been two months since I raced. The kids had a sleep-over last night - no need for emphasis on the "sleep," but praise God, because it's finally "over." Actually, they were all good, though they were good at different times... The boys went to sleep early (very good) and the girls didn't (not so good). Then the boys woke up quite early (not so good) and the girl didn't (good). Which meant - through much of this - there wasn't much rest to be had. Fortunately, I did six miles over lunch in the slush yesterday and since I helped co-chaperone last night's escapade, I got enough weekend cleaning done that I might go for a run/ride tonight, assuming I don't fall asleep, which is truly possible. Sent in my registration for the Ugly Mudder and am hoping the bad weather is gone next week. I don't mind running in crappy weather and I don't really mind driving in crappy weather. However, driving in crappy weather to run in crappy weather seems a bit tedious. The past two days, I've been in the basement on the trainer. Last weekend, I was in the basement on the trainer. My last run was last Friday. I can't take it anymore -- I'm going out over lunch. The weather's been 75% to blame. 10% of it has been the fact that my plan calls for me to ride more this month and the other 15% of it was that I had an ugly cold that made the 5 degree weather seem that much worse. But in twenty minutes, me, my tights, my pants, my shirt, my sweatshirt vest and assorted accessories are hitting the roads, for better or for worse. So in conclusion, there is a high degree of muscular and physiological specificity between the two modes of cycling. The best of both worlds would be to teach your legs to achieve a high cadence without the use of the flywheel. Next on the agenda is the Ugly Mudder Trail Run, one of the largest trail runs on the east coast. I'm in good shape for it and it sounds like a lot of fun. So why don't I feel 100% into it? Actually, it's a stupid reason. The course is unbelievably difficult - course record is about a 7:00 pace - so I know my result won't easily compute into my log. I won't be able to use it to update my VDOT progress, either. In short, aside from my age-group finish, it won't serve the purpose that most of my races do: to tell me how the heck I'm doing relative to my other races. But still, barring a snowstorm (it's 90 minutes away), I'm in. Streams, mud, branches and beer. If that ain't fun, I'm doing this stuff for the wrong reasons. Anywho, Zig believes that one of the secrets to work-life balance is, "Wherever you are, be there," which means if you're at work, don't be taking lots of personal calls, worrying about the kids, etc. And when you're at home, put away the damn Blackberry. I've tweaked Zig's mantra and applied it to working out in the past week and a half. Now I say, "Whatever the workout is supposed to do, do it." So I'm doing the hard stuff harder and the easy stuff easier. Before, I'd say virtually everything I was doing was tempo pace. I was feeling a little sore all the time. Now, I feel different. Call it: strategically sore.